Warm up with these comforting winter classics! 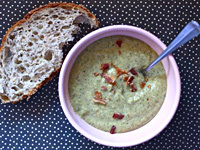 Broccoli-cheddar soup takes on a new twist with potato, and will keep you going strong all afternoon. Plus, plan the perfect Valentine's Day. Start with a warm mug of creamy Peanut Butter Hot Chocolate, and then serve the quick and easy Beef Stroganoff for a cozy dinner at home. A hearty soup that's perfect for snowy days! Blanch broccoli by placing it in boiling water for 30 seconds. Immediately drain and rinse with cold water. Set aside. In a large Dutch oven, melt butter. Peel and chop potato into small 1-inch dice. Sauté both the potato and onion in butter for about 6 minutes, or until the onion starts to become translucent. Add garlic and cook for 30 seconds more. Then mix in the dry mustard, cayenne, and salt. Toss to coat. Add flour and stir well. Pour in the broth and add back the broccoli florets. Stir and bring to a simmer. Cook for about 15 minutes, or until the potato is tender. Slowly pour in the milk and add the cheese, stirring to melt. Carefully pour the hot soup into a blender and process for 10 seconds, or until slightly smooth with just a few chunks remaining. Pour soup back into the pot and keep warm until ready to serve. Top with crumbled bacon before serving. Serve to your sweetie on Valentine's Day along with chocolate truffles for dessert. In a cast iron or heavy skillet, melt 2 tablespoons of the butter over medium-high heat. Add flour and whisk quickly, forming a caramel-colored roux. Cook for 2 to 3 minutes, stirring continuously and then slowly stream in the beef broth. Simmer for another minute and then remove from stove and set aside. In another skillet, heat olive oil and the remaining tablespoon of butter. Add the beef and brown on both sides (about 5 minutes). Remove with a slotted spoon when done and place on a plate to keep warm. Add minced shallot and mushrooms to the pan and cook on medium for about 6 minutes, or until the mushrooms have softened. Add the beef back to the pan and toss to combine. Put the sauce back on heat as well and add sour cream. Pour over beef and mushrooms and stir. Serve with buttered egg noodles or, my favorite way, with potato gnocchi. The perfect drink for a chilly Valentine's Day morning! Whisk together milk, cocoa powder, vanilla, and sugar in a small pot on the stove. Bring to a simmer and then add peanut butter, stirring well to get rid of any clumps. 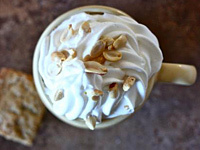 Pour into mugs and serve with whipped cream and salted peanuts!